Morven in 2007. Near Markham, Fauquier, Virginia. Photo by Jerrye & Roy Klotz, MD via Wiki Commons. You some time ago reproached me for giving as an excuse laziness for not writing oftener when the very last letter you gave the same excuse yourself. I have been intending to write to you for some time past but I have generally waited until mail day thinking I would write then but sometimes on that day I was interrupted by company and then again I would forget it on the day on which I was to write and so put it off until I have let quite an alarming length of time elapse since I have written; but it is better to write late than never as in that case you would think I had forgotten you but I can assure you that I very often think of you and your brothers and sisters with the warmest affection as I shall never cease to think of you as affectionate relations. Fanny and Mary write to me much oftener than they used to do. I think Fanny writes a very good letter and if she improves as much as I expect she will write a beautiful one in a few years. Mary writes very short ones so I cannot tell what they will be. I received one from James some time ago and I think it was written better than a great many young men would write. They say that papa's neighborhood is very unhealthy this summer which I am sorry to hear. They are very anxious to think it a healthy place but I know from the number of deaths and illnesses they mention that it must be very sickly. We are healthy in this neighborhood but within twenty miles of us death is making rapid strides. There is scarcely a family in Frederic [Frederick County, Virginia] in which there are not a great many sick. Parson Meade the (gentleman who my father wished to get to preach my funeral mothers sermon) lost two sisters on the same day in his house of the same fever which continues to rage over the ridge with the greatest violence. Eliza Marshall has lost her youngest child about eighteen months. She is very much distressed indeed. My children continue very healthy. You mention in your letter that papa was talking about raising a subscription for me to go to see him. I thought that he knew Mr. Ambler's situation too well to expect him to carry me over while he continued so much in debt. At the time we were married Mr. A. owed upwards of seven thousand dollars and he has been endeavoring to pay that off as fast as possible but the times are so dreadful for the farmers that he has gone on very slowly and still owes a very large sum and under such circumstances it would be unreasonable in papa to expect us to go over. I am as anxious as it is possible for any one to see my father brothers and sisters and grandpapa and his children but I do not calculate on going this year at all and next year is too far off for me to be making calculations about going but whenever I have it in my power to go I shall visit you all. It is unnecessary for me to make any apology for writing so bad a hand as I have written to you too often for you not to know that I cannot write more legibly. If you were a stranger I should certainly apologise. [Checked against a transcript as rendered in Virginia Magazine of History and Biography, Vol. XXIII, No. 2 (April 1915), pages 191-192. A few variations in punctuation. Biggest change is from "Farmville" in the 1915 transcription to Farrowsville in this one. Lucy Ambler = Lucy Hopkins Johnston (1800-1888) married Thomas Marshall Ambler (1791-1875) on April 14, 1819. 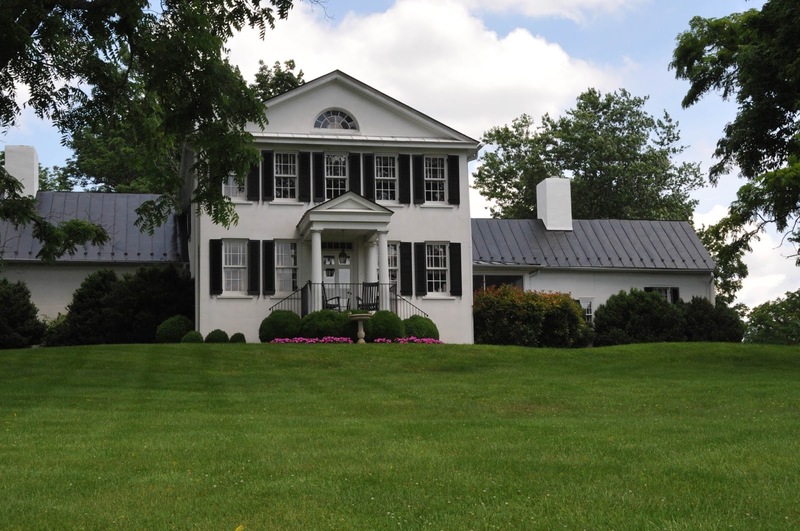 Their main abode was "Morven," Fauquier County, Virginia, from about 1820 on. For a link, see here. Children = Lucy Letitia Ambler (1820-1853), John C. Ambler (1821-1891) and Elizabeth Steptoe Ambler (January 20, 1823-1900). Sarah "Sally" Tate Steptoe Massie (1796-1828) was married to William Massie (1795-1862) and was the daughter of James Steptoe (1750-1826). Their son Thomas "Tommo" James Massie (1817-1877) was born on March 23, 1817.There is a massive Massie collection at the University of Texas here. Fanny = Frances Steptoe Johnston (1807-after 1850). Mary = Mary Morris Johnston (1810-1884). James = James Steptoe Johnston (1808-1895). Papa = Charles Johnston (1769-1833), residing at Botetourt Springs, Virginia. Parson Meade = The Right Reverend William Meade (1789-1862). Eliza Marshall = relative by marriage.